NY4316 : Why are AA vans yellow? Why are AA vans yellow? Oh I love pieces of useless trivia. More later. 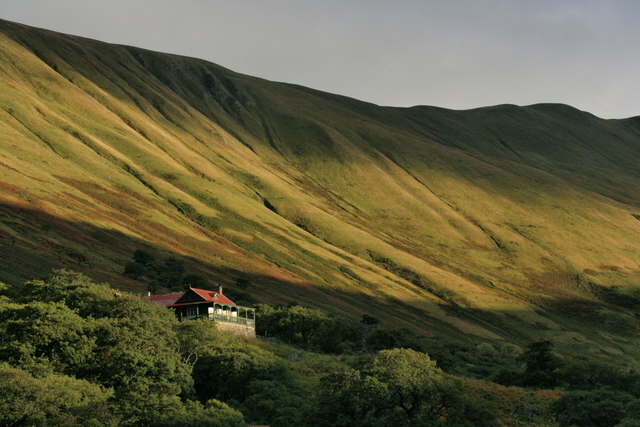 The photo was taken in Martindale, an isolated valley in the north east Lakes. Famous for its herd of red deer which, as this is the rutting season, were constantly bellowing from dawn to dusk. The red roofed building was built in 1911 by Hugh Lowther, the Earl of Lonsdale, as a shooting lodge. It’s known as “The Bungalow” and still retains its original decor and features. Well I tell a lie there. Originally it had an electrical supply powered by a small hydro plant in the beck. The cables and fittings are still there, solid copper wire insulated by fragile rubber and cotton with a push button bell system to summon the servants. But today there is no electricity at the Bungalow. In 1912 the German Emperor, the Kaiser, was a guest of the Earl at the lodge. He had been the Earl’s guest twice before staying at the Earl’s seat, Lowther Castle, the last time ten years before. The story goes that the Kaiser was particularly fond of shooting rabbits. The Earl had known of this so he had his gamekeepers trap hundreds of rabbits from around his estate and taken to a particular patch of woodland. The Earl then happened to mention to the Kaiser that he often finds a rabbit or two in a particular wood and maybe they ought to take a look. Upon their approach the gamekeepers released the rabbits and the Kaiser shot away to his heart’s content. I wonder whether the conversation between the Earl and the Kaiser that night in the lodge sitting by the roaring fire was confined to just deer, hunting and rabbits. Or would there have been any hint of the tragedy that was to unfold just two years later. Now, back to the question. Why are AA vans yellow? Well the favourite colour of the Earl of Lonsdale happened to be yellow such that he was often referred to as the Yellow Earl. His large collection of carriages were yellow. He had his own private railway carriage painted in his distinctive yellow livery. And I once read he had a yellow Rolls Royce although I may have imagined that. So when the Automobile Association was established and he became its first president, he allowed the organisation to use his distinctive yellow livery on their vehicles and which it still uses today. This page has been viewed about 280 times.